After what seemed like forever, Apple app aficionados are finally seeing updates to iLife—iPhoto, iMovie, and GarageBand—for both the Mac and iOS. All versions are available today and all are free with the purchase of every new Mac or iOS device. All apps have been updated to 64-bit and are integrated with iCloud. Eddy Cue, senior vice president of Internet software and services, was on hand at Apple’s Tuesday event to do a very brief demo of the new iLife features. With 64-bit support, photo browsing in the new iPhoto appears to be faster. Cue touted the iOS version’s “clean and beautiful” new look. 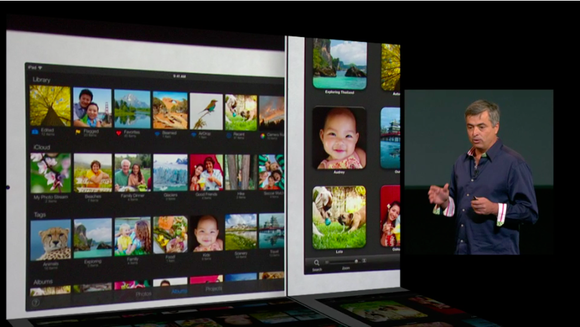 You can now share images as custom slideshows that you can pause, rewind, and fast-forward via gestures. You can also order prints, including panoramas and hardcover books. 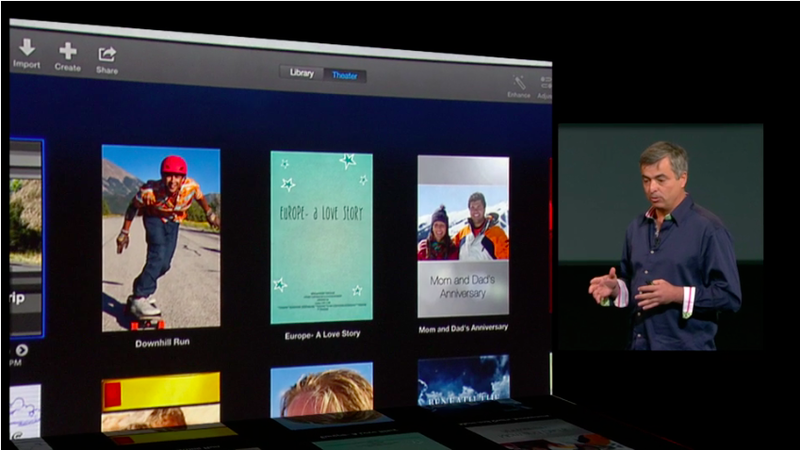 Photo Books—hugely popular but previously available only on the Mac—have now moved to the iPad. You can use iPhoto for iOS to lay out your book and employ multitouch gestures to move photos and text around the layout. When you’re done, you can upload everything to Apple servers, from which the book will be printed and shipped. 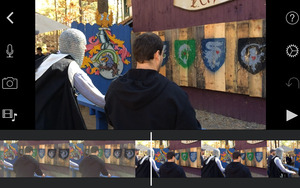 The new version of iMovie also gets a slew of new features. For starters, Apple has redesigned it for both iOS 7 and the Mac. Cue said it’s now easier to browse and share videos with family and friends. You no longer need to create a project or edit your footage; you can just select the clip you like and tap it to share it. Now all the desktop-class effects, such as changing video speed, are available on Apple’s mobile devices, too. On the desktop, it’s now easier to speed up and slow down video, as well as to add effects, which is great for the footage you capture on your iPhone 5s. You can create split-screen and picture-in-picture effects or advanced audio edits with a few taps. A new feature called iMovie Theater acts as a private screening room, putting all movies, trailers, and shared clips in one place. When you create a movie on your iPhone, it’s available across all your devices via iCloud—even on the Apple TV. Finally, GarageBand on the Mac also gets an overhaul with, among other things, a new sound library and features such as Drummer and Smart Controls. One major component of the iOS 7 revised version is that it goes from supporting 8 tracks to 16 for many iOS 7 compatible devices; if you have a 64-bit device (using the A7 chip), you can go up to 32 tracks, just as on the iPhone 5s. And, thanks to iCloud, you can start a song on your Mac or iPhone or iPad, and you’ll always have access to the same version. Apple demoed the new Drummer feature, which plays along with your songs at your direction. You can pick the style of drumming, and even choose the instruments (much as with the Smart Drums on iOS GarageBand). The accompaniment is based on the work of real drummers, in a variety of genres. Additionally, you can record from third-party music apps right into GarageBand and wirelessly share via AirDrop your song projects with other iOS users for easy collaboration. iCloud keeps song projects updated across devices. The iLife apps are free with Mac purchases. Current users running Mavericks can update their apps for free from the Mac App Store. In addition, the iLife for iOS apps are available for free from the App Store for any new device running iOS 7, and are also available as free updates for current users. GarageBand for Mac and iOS are both free for all OS X Mavericks and iOS 7 users. 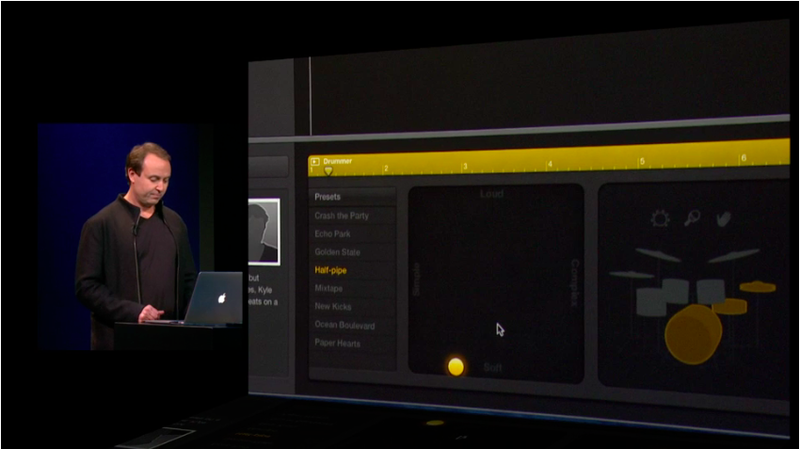 Additional GarageBand instruments and sounds are available as an in-app purchase of $5 for each platform.